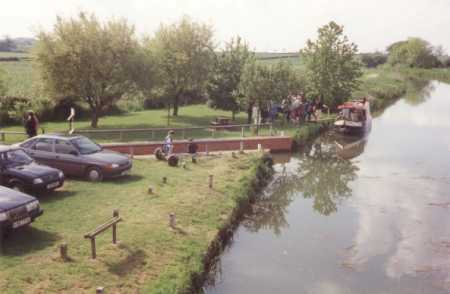 A rather wet day in June 1990 could not dampen spirits as Richard Mercer – Area Manager for British Waterways – declared the slipway open at Denton Wharf. The building of the slipway is a milestone of co-operation between waterways enthusiasts and British Waterways to get boats back onto the Grantham Canal. The slipway was built entirely by volunteers from the Grantham Canal Restoration Society*, Inland Waterways Association and the Waterway Recovery Group and is a valuable addition to the picnic site facilities that were built there two years previously. Six largish boats were launched onto the canal by the slipway and a number of smaller dinghies and inflatables joined the fun. In January 1992, Denton Slipway was awarded the prize for Best Leisure Project of the Year by the British Marine Industries Federation. The award was presented at the London Boat Show and consisted of a handsome plaque and most importantly, a shiny Mirror Sailing Dinghy worth nearly £2000, to be used on the Grantham Canal.